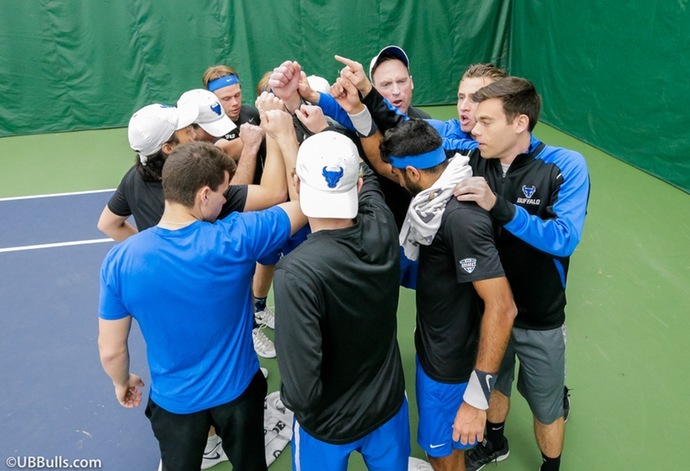 PRINCETON, N.J. -- The University at Buffalo men's tennis team competed this weekend at the ITA Northeast Regionals at Princeton, seeing action in both singles and doubles play. In singles, UB had two players advance to the round of 32 including junior Vilhelm Fridell, who got a first round bye and advanced to the round of 64 where he defeated Evan Bynoe of Cornell, 6-3, 6-3 before falling in the round of 32 to Dan Martin of Dartmouth, 6-4, 6-1. Junior Hao Sheng Koay also received a first round bye and then won his match in the round of 64 against Galen Lee of Harvard, 6-3, 6-1. Koay fell in the round of 32 to Will Peters of Princeton, 6-4, 6-4. Senior Ethan Nittolo won his opening match with a 4-6, 7-5, 6-4 victory over Marcus Smith of Hofstra and sophomore Nickolas Frisk won his first match of the tournament with a 6-3, 6-4 win over Jack McLister of UConn. Sophomore Transfer Valdemar Holm also won his first match of the tournament with a 6-3, 0-6, 7-5 victory over Zack Elliot from Lehigh. All three players lost their matches in the round of 64. In doubles action, all three pairs won their opening matches in the round of 64. Holm and Nittolo scored an 8-7 win over Cheng and King from Yale, while sophomore Matthew Johnson and freshman Simon Wibler defeated Gonzalez and Mowrey of La Salle. Fridell and Koay opened up doubles with an 8-3 win over Petrovic and Zavikas from NJIT. All three duos lost in the round of 32. "It seems like every year it's a broken record at regionals, and I for one am disappointed we are on our way home," said head coach Lee Nickell. "We have talked about learning from losses, but from my vantage point we haven't done that. We blew numerous break leads in every match we lost, and that was due to lack of discipline and competitive spirit in big moments. We are considered one of the best non ivy teams in the region, but I didn't come to UB to be satisfied with playing second fiddle to the Ivy League teams. So now that another opportunity has passed its time for all of us to look in the mirror and decide if we truly want to be elite, or just a good team. I am looking for one of our student athletes to step up." The Bulls return to action next weekend at Dartmouth Invitational.